It comes as no surprise that according to VWO 30% of A/B testers have a CTA button as their first choice for what they would like to test. Your website’s Call to Action is critical in initially drawing your visitors attention and guiding them through the next step in the purchase funnel. It ticks all the boxes from a Conversion Rate Optimisation (CRO) perspective – simple to implement, TICK…..high impact, TICK! Call to Action buttons are split into two components. The design (size, shape, colour…), this is about capturing the attention of your site visitors. And then there’s copy, this should be focused on getting that all important click and setting the expectations about what the user should expect to happen. This is what we’ll focus on today. Your copy should demonstrate the benefit of clicking. What do I get for clicking on your CTA? This doesn’t mean you have to crowd your CTA with a long-winded explanation. 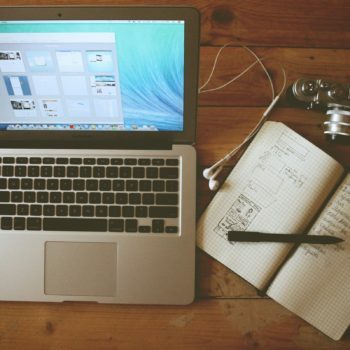 A good practice is to include some compelling copy around your CTA button that adds context. In this example we can clearly understand what we’re getting. The problem is that users (including me) are sceptical of “free trials”, in my experience I expect to be taken to a landing to page immediately asking for my credit card details. So naturally my desire to proceed is diminished, except here the message is reinforced with 3 clear benefits, to start my free trial I don’t need to hand over my card details, I don’t need to download anything and there is no obligation. Suits me, click! Use language in your CTA that helps your visitors navigate through the conversion process. It removes any misunderstanding and puts users in control. A great example of this is Amazon. Simple use of language such as “Proceed to checkout” focuses the user and highlights the next obvious step in purchasing the product. Our advice for CTAs has always been to keep them short and to the point. Don’t write copy that will take your users a long time to read and more importantly understand. Where you can, use numbers in your CTA. Data is great way to quantify your message and provide real specific expectations. You can tell your users what they’re getting, how much or for how long. It’s no wonder most blog posts these days (including this one I may add) starts with a number. 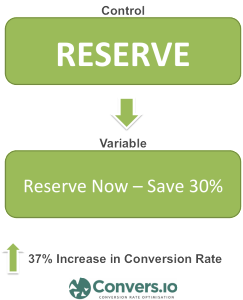 In one of our recent A/B Call to Action tests with a client we tested their standard rate saving for online reservations in the copy to great success. In any tests we do we always ensure the copy we’re using is realistic. It should always be a true reflection of your proposition. After all, we’re not doing this simply to increase CTR, we want to turn these visitors into conversions and the best way to do that is to be honest and not over-exaggerate. If possible, I would suggest making sure you’re providing consistent messaging in the following stage of the conversion funnel. In our example of the client above we ran this test as we had messaging in the basket that clearly explained and displayed the 30% saving. There are so many ways to approach and trial CTA copy. There is no single correct way to go about, keep it simple and honest, keep it short and concise, demonstrate the benefits and guide your users. Like we said in our recent blog post, one of the most important things about CRO is just do it. 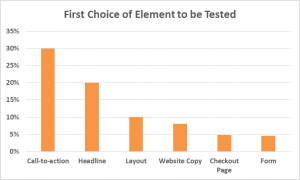 Run those tests and find out what works best for your visitors. It’s a simple, cost effective way to make more sales.